Pictured, Duquesne University student Maquis Brown and the building, Brottier Hall from where he jumped. 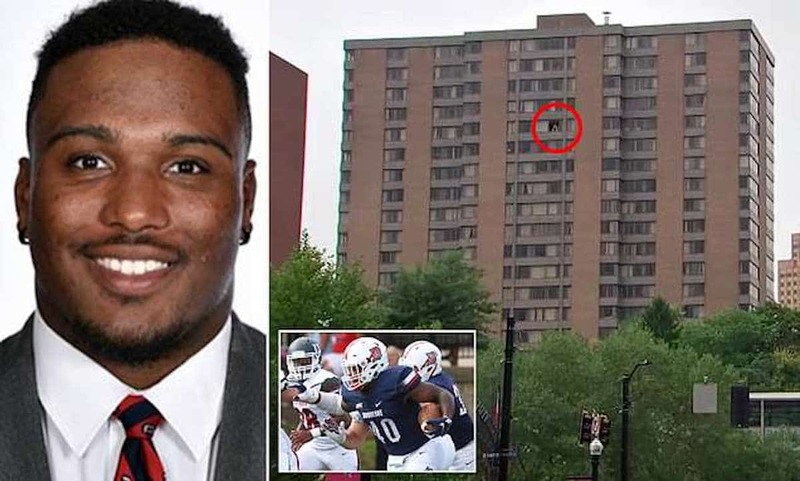 What led to Marquis Brown a Duquesne University junior running back jumping from the 16th floor of private campus residence hall, Brottier Hall? A college football player has died after jumping from the 16th floor of a private residence hall on campus. The Duquesne Duke reported Maquis Brown, 21 dying Thursday night, circa 10.30pm shortly after campus police responding to a disturbance on the college student’s floor. Brown, a junior running back at Duquesne University in Pittsburgh, Pennsylvania, was in critical condition after the fall and taken to Mercy Hospital. The man was later pronounced dead. Pittsburgh officials say campus police were questioning the sophomore in Brottier Hall in response to an altercation on the 16th floor when he ran towards a nearby window and jumped out. ‘It is with great sadness that I report that we had a tragedy on campus last night,’ Duquesne University President Ken Gormley said in a message sent to students and staff. Brown’s death came just days before the university’s homecoming game. Head football coach Jerry Schmitt said the team met and decided that ‘the best way to honor JB’s memory is to play Saturday’s game as scheduled’. ‘We left the decision purely up to the team and made it clear that we would support them whether they chose to play or not,’ he said in a statement. A friend of Marquis Brown’s and fellow student, Eric Williams Jr, said he saw him minutes before he jumped. ‘I just had saw him before I left to go to Brottier, he was at my apartment. I just saw him 30 or 40 minutes before. So it is just shocking. It’s crazy,’ Williams told CBS Local. Brown who hailed from Washington was listed on the Dukes’ official roster as a sophomore running back. After not appearing in any games during the 2017 season, he tallied three carries for seven yards in his first game this year against Lock Haven on Sept. 1. Brown’s former football coach at DeMatha High School in Washington, DC, posted his condolences on Twitter. Officials have not yet revealed what they were responding to on the 16th floor and Brown’s death is under investigation. It remained unclear if the student was under the influence of any alcohol or substances. When my story’s told, how will they tell it?